So, it took us just over a year, but we fought our way through to a result in the Operation Martlet Pint Sized Campaign for Chain of Command. You can find reports from all the games here: Operation Martlet. So now that it’s all over, how did the campaign play as a game? And how did our results differ from history? The early stages of the real operation were chaotic, in the dark with heavy mist and a thunderous barrage the inexperienced troops of the 49th Infantry Division got lost and confused, and the attack floundered for several hours. 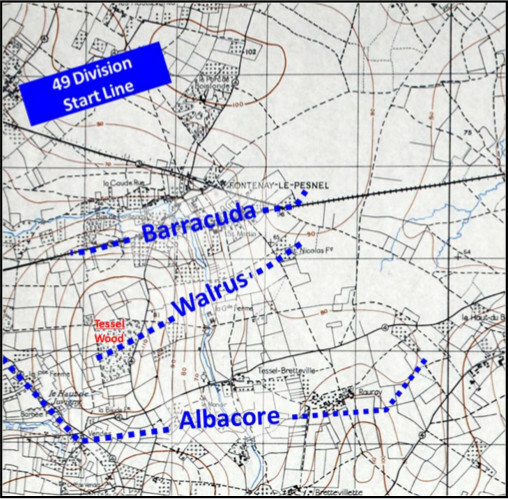 What elements of the attacking units could make it to Barracuda (Fontenay) dug in and there was heavy fighting to evict the Germans from their main line, with several German counter-attacks reported. In our campaign, things went very differently. The British weren’t severely affected by the mist, although perhaps the defenders were as the lead elements of the British advance found their way through the German pickets quickly, and then hit the main line like a hammerblow, forcing the Germans to abandon Fontenay entirely (they took so many casualties in game 2 that they gave ground in the next campaign turn). Back in the real world, the British sent forward their next wave of troops, passing through the lines of the units now dug in on Barracuda. Finding no real opposition, the advanced quickly to Tessel Wood, on Walrus. The relative lack of German opposition may be explained by the advent of a broad counter-attack, but it failed to push back the British. Troops moving up to attack the fortified farm of St Nicholas were diverted the clear German defenders still holding parts of Fontenay, which they managed to do by nightfall. In our campaign, the British were firmly in possession of Fontenay by this stage and moved on to St Nicholas. They attacked in the late afternoon, but were soundly defeated, and the Germans seized the initiative and struck back towards the British line at Fontenay, but were unable to make inroads into the British position. Overnight the real German army had reorganised its line, plugging a large gap between 12th SS and Panzer Lehr with whatever units could be found. They also ordered Fontenay abandoned and the new line was to centre on St Nicholas. 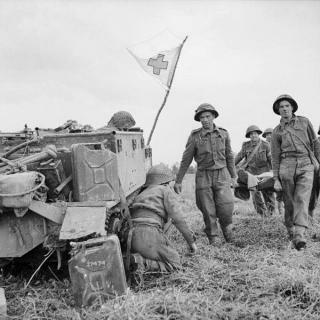 They threw in armoured reserves from all over, clearly not expecting the larger blow that was to fall when Operation Epsom was launched later in the day. The British resumed their attacks, but made little headway. A major attack on the southern flank blundered into a German thrust trying to make contact with Panzer Lehr and a brief tank battle raged before the Germans withdrew due to reports of Epsom kicking off nearby. A British attack on St Nicholas was also stopped in its tracks (I know how that feels…). In the real world the British had only taken one crack at St Nicholas, and in their second attempt they used massive artillery and overwhelming force to finally overrun the German strongpoint by 1800. The assault troops dug in on the objective and another passage of lines saw fresh troops move up to the outskirts of Rauray almost unopposed. In game terms this would have meant there was probably no fighting over Scenario 5, with the Germans presumably giving ground after taking a mauling at St Nicholas. In wasn’t until midday of the following day that the British captured their objective in Rauray. So in terms of the campaign’s victory conditions the real world result at the end of June 26th was that the British definitely held St Nicholas (narrow German victory) and possibly held the ground at Scenario 5 “Winning Your Spurs”, which would mean a draw. Our campaign saw the British fail two more times to assault St Nicholas (first, second) and another German attack on Fontenay. So the British in our campaign had failed to achieve as much as they did in real life, but to be honest the difference wasn’t massive. Judged by the campaign’s victory conditions the British didn’t win in real life, as they were unable to capture their objective at Rauray in time before Operation Epsom began. This is a tally of all the permanent losses (ie: “dead” in the ATSE rules) whether from the core platoon or supports. Both sides had lost their original platoon commanders, both killed late on the second day. The German officer was killed by a demolition round from the British AVRE which struck the building he was in at St Nicholas, while the British officer died leading a bayonet charge into the ruins of the same farm only a few hours later. Two more Sherman Vs were damaged, probably repairable. 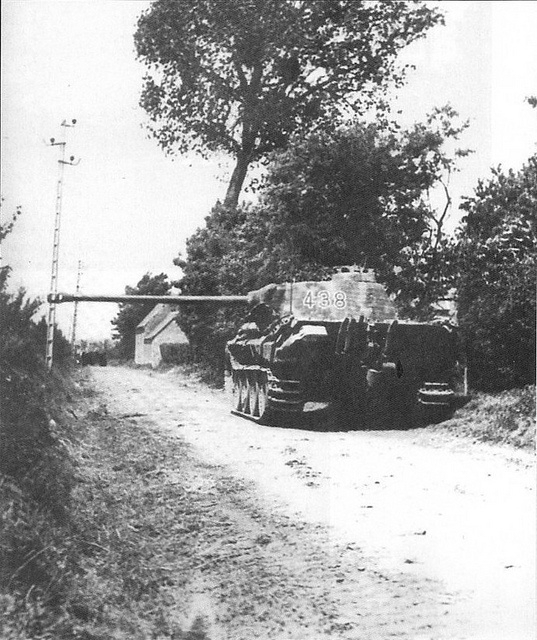 Also, two more Panzer IVs were damaged and recovered, while a SdKfz250 was damaged and abandoned to the British. Both sides took two prisoners. The Germans picked up two Brits (one an NCO) in game three, while the British picked up two shell-shocked Germans in the aftermath of game seven. The big tank battles around St Nicolas in game 3 and game 10. Panzer’s eye view of the carnage. Yes, that is a Panther standing in for the Panzer IV. One of those resulted in our first ever gong in a campaign, with a German tank commander being awarded the Iron Cross 1st Class, no less! 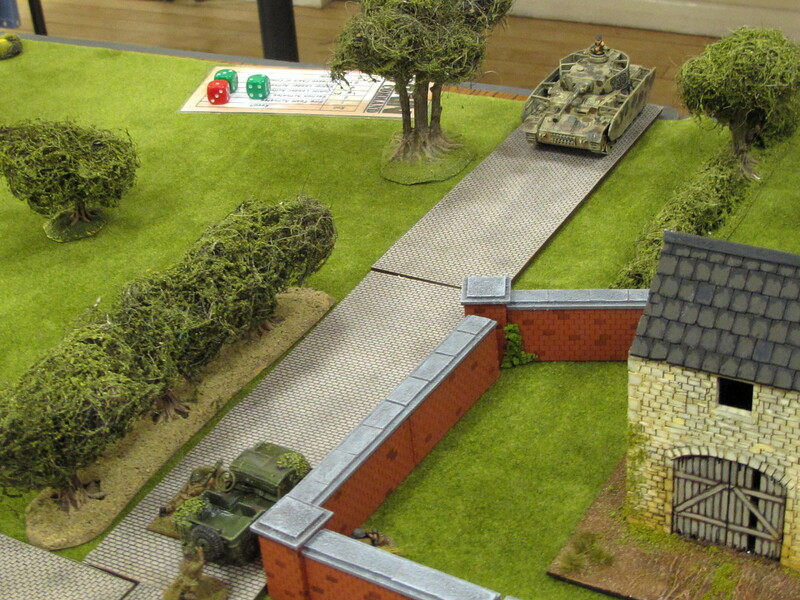 The novelty of an all-AFV force in game 5. The format of the Martlet book is familiar to anyone who’s played a Pint Sized Campaign before; you get a fairly in-depth history section up front, with all the campaign scenarios following. Personally I’d switch that around, as after the first time you read it you’ll always be wanting to get to the scenarios and rules quickly. Overall the campaign is well-designed, with good maps and clear description of the forces. One area that is somewhat confusing is the objectives and campaign length. The length of the campaign is described differently in two places, and there was some confusion about how many turns the British actually had to capture their objectives. Incidentally this same flaw exists in the companion Scottish Corridor campaign. This should have been picked up in proofreading or playtesting, surely? The army lists presented benefit from some useful clarifications over the main rule book (such as the use of panzerfausts) but it’s disappointing to see that Rich hasn’t made any use of the excellent work done by the community’s Consolidated Arsenal and is still using vehicle stats from the original rule book. The British AVRE could also do with some rules to reflect its unusual main weapon; Rich suggested some on his Yahoo group and those were the rules we used, I would have liked to see these in the campaign booklet as they really are needed to make the AVRE a realistic and playable option. Many players also feel it’s worth restricting it from firing at moving vehicles, I didn’t even try that myself, as it’s just not what an AVRE is for. It’s an engineering vehicle, not a battle tank. Still, at the Pint Sized price you pay you can’t really complain about what you get in the book. We played 10 tense and interesting games, which probably works out at about 10p per hour of wargaming fun. So despite any little niggles I’ve raised here I say well done Rich, and keep writing them! This is a long campaign. I’m not sure I’d want to tackle one much longer than this. In our case we got stuck at one point on the ladder. I’ve subsequently heard from several other people who also found the farm at St Nicholas very, very hard for the British to take. This resulted in our campaign ping-ponging back and forth over the same two tables for the last eight games, which was starting to get a little boring IMO. The British really do have their work cut out for them. I’ve never heard from anybody who actually reached Rauray in the allotted 11 turns, if you’ve pulled it off I’d love to hear your war stories! Great report – loved every minute of it. I was fascinated on how the terrain pieces changed from play-to-play of the same scenario, It widened the scope of the games I run as I was trying to be very slavish to the scenarios as mapped. Yep, close enough is close enough as far as we’re concerned. I followed your whole campaign and thoroughly enjoyed it. When using British, i’ve always had the section Corporal spend his points to get the Bren to target just the MG42. They either get taken out or it forces their NCO to keep replacing the crew thereby shrinking the rifle team. I’ve had lots of luck so far. Are you going to show your Scottish Corridor campaign as well? Yep, keep an eye out for some Scottish Corridor stuff in the next couple of weeks. Thoroughly enjoyed reading this set of reports. A friend and I played the Martlet Campaign last year and I foundered as the Brits as well. Was tough going at the time but your reports make me think about having another crack at it. I just finished reading through all of your reports from this campaign. Beautifully written and illustrated. Inspiring stuff. Thank you. I’m just about to re-embark on this campaign and have really enjoyed reading through your posts regarding your attempt at it. Many thanks. By the way, when I played this through last time I was playing as the Germans and I suffered a terrible defeat, I believe my British opponent made it through to the last battle – I know I didn’t finish doing the write ups as it was just too painful! !